Some of the things we eat during the summer are terrible for teeth. Regular dental care can keep your teeth healthy, but what you eat matters too. Food can have a big impact on overall mouth health. Here are some foods to avoid this summer. Citrus Fruits – Lemons, orange juice, and tangerines are full of vitamin C, which is good for you. However, they’re also highly acidic and can damage your tooth enamel. One study tried soaking pulled teeth in different juices, and found grapefruit and lemon juice did the most damage. If you want to make sure you’re getting enough vitamin C, store-bought orange juice is a less acidic, more tooth-healthy option. Sticky Candy – Chewy candy (caramels, taffy, and gummy bears) stick to your teeth long after you’ve finished eating them. 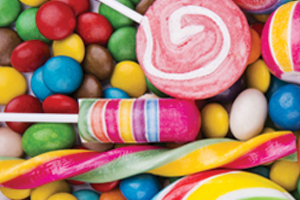 Sugary residue stays between teeth and turns into an acid that eats through enamel. Sugar really does cause cavities. The chewier your candy, the worse it is for your teeth and gums. Ice – When temperatures soar, it feels good to munch on ice. It seems like a calorie-free way to cool off. Many people think ice is good for your teeth, but it isn’t. When your teeth repeatedly crunch down on ice’s hard surfaces, it can chip edges and damage enamel. Dried Fruit – Families pack trail mix for summer camping trips, and it often contains dried fruit. While it may seem like a healthier choice than candy, dried fruit sticks to your teeth and causes some of the same problems that come from eating sugary snacks. If you eat it often, make sure you rinse your mouth immediately after and brush as soon as you can. Soda or Sugary Drinks – If you drink something that has sugar in it, that sugar is washing over your teeth. Some of it sticks to cause tooth decay. Sodas are also acidic, so they attack your enamel. When it’s hot out, choose sugar-free beverages. Swap your sweetened sodas for water to maintain overall dental health. Alcohol – Alcohol dehydrates. When your mouth produces less saliva, over time it causes tooth decay and gum disease. Cobblestone Park Family Dental can help you make sure your teeth and gums are healthy after a summer full of fun. Call today to set up an appointment.